When performing the pearls of Mozart's music, Rondo in A minor, Concertos in D minor and in A Major, Yudina creates a very special world. In Rondo in particular she reaches unique intimacy of restrained feelings while displaying the finest nuances and cultivated impeccable taste in rubato in every phrase. Listening to this music that is full of true poetry and deep melancholy is a great aesthetic delight. 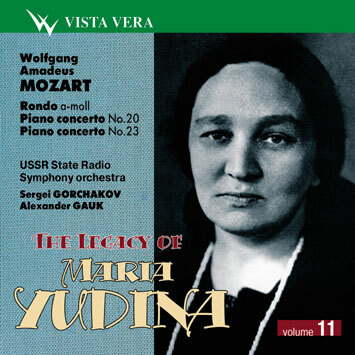 It brings a memory of Maria Veniaminovna reciting encore poems by Gumilev, Akhmatova, and Pasternak at her concerts…In Mozart's concertos Yudina captivates listeners by amazing will and perfect intoning. The piano seems particularly sensitive in responding to every touch of her fingers. It is not a pretty sound of which people usually say that it sings. The instrument under Yudina's fingers speaks. It is rather recitative, declamation with every inflexion of sound being flexible and expressive. Listen carefully to the first theme of the Concerto in D minor. The music talks to you; it draws your attention to something very important. Some scholars of Mozart received a great shock with Yudina's illustrious fermata at the very top note. And then how Mozart's passages, figurations, arpeggios, ornamentations talk to you! What a wrathful force of the theme in finale of the Concerto in D minor! What a truly youthful fervour in the extraordinary impetuous finale of the Concerto in A minor! Yudina presents Mozart, alive, ingenuous, sometimes a little bit rough, sometimes melancholy, and then again full of life-asserting energy.